Instantly add volume or extra coverage for thinning hair with XFusion’s keratin-based hair fibers. Custom blend XFusion fiber shades to perfectly match the client's color. Kit comes with a variety of mixing spoons to provide the most precise shade blending and a Mixing Guide to provide examples for mixing custom shades. Once the desired shade is created, store in a bottle provided and label for future use. 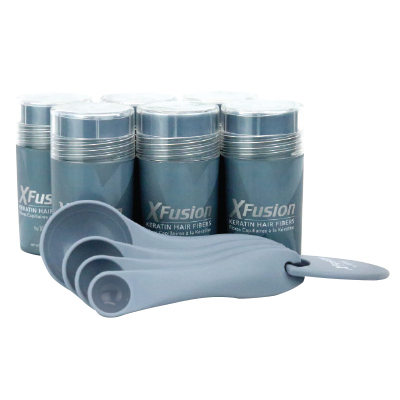 Kit includes: Various Sized Measuring Spoons - 4 ct., Mixing Guide, Empty 15g XFusion Fiber Bottles with Blank Labels - 6 ct.